Proving that you can't keep a good Chipmunk down, Alvin and The Chipmunks are back again with Alvin and the Chipmunks: The Squeakuel.Now in the care of Dave Seville's nephew (Zachary Levi), Alvin, Simon and Theodore take a break from pop-music stardom and return to school. Almost immediately, the tiny tunesmiths are given the giant task of saving their school's music program by winning a battle of the band's contest. Though the boys think winning the contest will be easy, romantic and musical sparks fly when they meet Brittany, Eleanor, and Jeannette -- also known as The Chipettes. Being a fan of the original, their music, the cartoon, and the first film, I eagerly anticipated; and I am proud to say that if you are a fan of any of the chipmunk's previous outings, this film will not disappoint. Alvin, Simon, and Theodore fit comfortably into their old roles as lovable chipmunks, while the Chipettes add a great addition for the tween girl's in your household. The small roll given to David Seville (Jason Lee) is a bit upsetting since he was so prominent in the first film; however, the addition of Zachary Levi (NBC's Chuck) to the cast provides an extra dynamic to the relationship of the Chipmunks and the Seville family. If you enjoyed the music of the first film, then this film will not disappoint with enough Chipmunk music to drive any fan crazy with delight (or any non-fan insane). The film includes such hits as: You Really Got Me and Single Ladies (Put A Ring On It). While the Alvin and the Chipmunks: The Squeakuel DVD quality will never come close to its Blu-ray counterpart, it definitely holds it's own with a great transfer that upconverts on your high definition without too much artifacting. The computer generated Chipmunks blend flawlessly with their human counterparts create a very believable world. As with most non-action films, audio is not as important as the picture quality; however, 20th Century Fox really lets it shine with a great Dolby Digital 5.1 audio that truly bring the Chipmunks and the Chipettes world to life. Music Videos: Five in total, three of which include sing-a-long karaoke-style lyrics; • The Chipmunks: Behind The Squeaking: A VH1-style investigation into The Chipmunks. 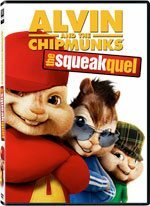 If you have every been a chipmunk fan or just are curious about this film, with Alvin and the Chipmunks: The Squeakuel is a film of pure delight to enjoy with the entire family. Download Alvin and the Chipmunks: The Squeakquel from the iTunes Store in Digial HD. For more information about Alvin and the Chipmunks: The Squeakquel visit the FlickDirect Movie Database.